Gay Pride Week 1973. Photograph by Frank Prain. 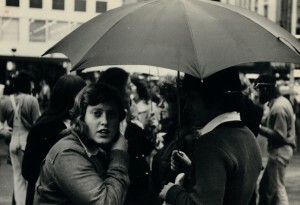 Courtesy of the Australian Lesbian and Gay Archives. ‘Out of the Closets, Into the Streets’ is screening at the 2018 Melbourne Women in Film Festival as part of the Shorts Session 1 session 4pm Saturday 25 February at the RMIT Cinema, 113 Swanston Street Melbourne. Tickets $18/$15.